It does not seem possible that I will be 75 this month and that I’m still able to function, almost! This past year has been reasonable for us. We are still living in our big home in central New Jersey, about an hour from NY City by train or car. My son Jason, resides with us so that he can help care for his mother, especially lifting her in and out of her wheelchair. Our housekeeper and caregiver is wonderful and worth her weight in gold; it would be hard for us to function without her. My daughter Lory, also lives with us. She is a wonderful help to both of us, has a keen sense of humor, and commutes into NYC for her job as editorial director of the College Board. JoAnn is now burdened physically and mentally by her Parkinson’s disease diagnosed over 30 years ago. We miss having grandchildren so if you have any to spare, please let us know. However we are close to most of our nieces, nephews, and godchildren. We have an empty guest suite and love visits, just give us a call! 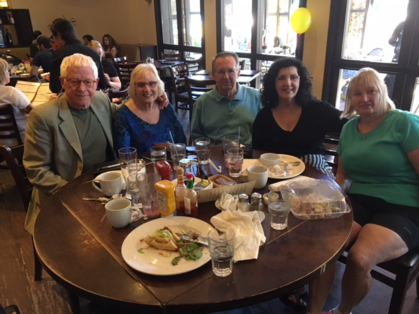 It was great to get together with Tom and Rene Bury in NYC a few weeks ago. They seem to be doing well and hardly ageing. I talk to Donna about once a month. The class web page is a treasure, many thanks to Donna for her efforts. With my mildly failing eye sight (gave up driving at night two years ago), somewhat decreased hearing (only my wife and daughter seem to complain), my bad knees and arthritis, and slowly progressing diabetic nephropathy, my beloved international travel is a thing of the past. Lory, who shares my love of travel spent three weeks with friends in England and Ireland (she had spent four years living in England while getting her masters degree in international diplomacy at the University of London) and has a trip planned to Germany in May to be godmother to the grandson of John Clorius. 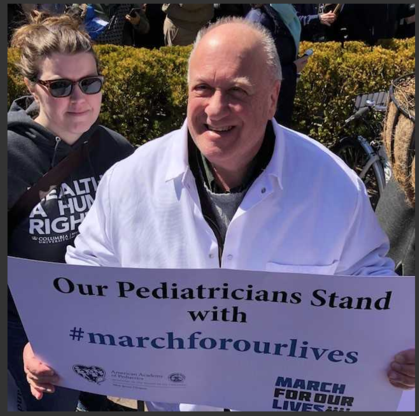 In spite of my infirmaties, I am able to keep busy and productive with activities as a student and resident teaching and as a somewhat rusty clinical advisor to my pediatric infectious disease partners, as well as activities with the NJ Chapter of the American Academy of Pediatrics. Having some time for scientific and political writing has also become fun; if you want to see some of my articles please email me at: lfrenkel@uic.edu. We continue to relish our good friends and loving relatives. Have a very Merry Christmas, a Fine Hanukkah, and a Happy New Year! (Iroquois people) from the Creator. The game has been played for thousands of years by the Haudenosaunee. Lacrosse is played in the summer and was originally used for training and conditioning of players to prepare for the fall season of war. There are now two styles of the game: one is played with nine players and a goalie per team and is called "field lacrosse." The second style is "box lacrosse" played by Canadian hockey players who wanted to keep in condition; they borrowed lacrosse from the natives as a five person and a goalie team to play in a hockey rink. For many years the Ivy League colleges and service academies (Army, Navy etc.) were the only players of the game beside the Native Americans. The game now is the fastest growing of any sport. There are now teams from around the world; during a recent international tournament, the U.S. team was first, Canada second, and the Iroquois Nationals third. Other participating teams were from Israel, England, Australia; and many other countries fielded outstanding teams. The gift from the Creator has taught me many things for which I am thankful: team work, discipline and athletic skills. I am from the Seneca Nation and played many years of box lacrosse on the teams of the Haudenosaunee territories of the U.S. and Canada. I also played field lacrosse at Syracuse University and the New York City and New Jersey Lacrosse Clubs. Respect for the game and most importantly, respect to the Creator, are what as a coach, I have asked my players to understand. Foul language and improper behavior are not to be tolerated. The language of the Haudenosaunee has no "swear" words. The people of the world should take a lesson from Dewae:o and respect one of the many gifts the Creator has given us. This year has again been reasonably good to all of us in the Frankel Family. We did lose two of the remaining beloved older relatives on my mother’s side so I guess I am now the oldest of the Frenkel elatives. I am not sure if this is good or bad! JoAnn continues to struggle with her Parkinson’s disease but in spite of her frustrations she continues to be loving most of the time. Fortunately she enjoys guests, visits by neighbors, TV and catalogues and dreams about buying things for everybody. Jason and Lory are helpful to their mother. Maritza, her caregiver, is a godsend. Lory has a new job in NY City as editorial director of the College Board. The long days at work and the hour long commute each way, her free time is limited. She was able to take one international trip this past summer to England to see the Wimbledon tennis matches and visit friends. My Activities continue to pleasantly occupy my time and keep my brain from deteriorating too quickly. JoAnn and Lory tell me my hearing is going but I hear everything that I want to, just fine. I know that my vision is going and I decided to give up driving at night about a year ago. It is a pain at times especially when I have evening Pediatric Academy meetings or other commitments. My arthritis has slowed me down quite a bit and my diabetic renal disease is a concern. Hay, I am not complaining: I never expected to make it to 74! Honestly inspite of my infirmities, I am able to continue teaching at the medical school in Rockford a couple of weeks each year and attend infectious disease rounds at the hospital in New Brunswick once a week. I was able to present a keynote talk at the First International Zika Virus Conference in Washington DC in February of this year. Last month the European Journal of Clinical Microbiology and Infectious Diseases published our review article entitled:” The Pathogenesis of Microcephaly Associated with Zika Virus and other Pathogens”. Writing it was a fascinating learning experience for me however, I would not recommend the article to you except for bedtime reading when you do not want to take a sleeping pill. We continue to relish our good friends and loving relatives. Since JoAnn can no longer travel, we hope that you will come and visit. We have a dedicated guest room and good help. Have a very Merry Christmas, a fine Hanukkah and a Happy New Year! The sea lions, pelicans, iguanas, sea turtles, giant tortoises, and many other creatures on the Galapagos Islands live in peace together with "most" human beings. My wife and I were fortunate to take a tour of the islands to see places and wildlife unlike anywhere else on earth. The most amazing thing was how those birds and animals have evolved to adapt to the harsh conditions and the arrival of humans. Ships carrying pirates and other seamen searching for fresh water and food were the first to discover the Galapagos archipelago, created from volcanoes and spanning the equator 600 miles west of Ecuador. The giant tortoises are almost the size of a small car and live to be 180 - 200+ years old. The seamen took them for food and almost led them to extinction. Since then, the "new humans" who now inhabit the islands have saved them and they now flourish. Having grown up on the Seneca Indian Reservation adjacent to the Alleghany National Forest, River and Mountains, I was exposed to the animals, birds and fish. Animals have an outstanding ability to adapt to their environment. Wild turkeys have great eyesight, but not hearing; white tail deer have exceptional hearing and sense of smell, but not good vision. During the last 60+ years of hunting, I've noticed the deer and turkeys foraging together, each taking advantage of their strengths for mutual safety. In the opening of this editorial, I mentioned "most" humans. During our trip, there was a couple that time after time infringed on the "space" of the animals to pose for photo opportunities. I mentioned to the couple that animals and birds are not afraid of humans and to treat them with respect - to no avail. For thousands, and perhaps millions of years these animals, birds and fish have lived in harmony - maybe we should learn from them.